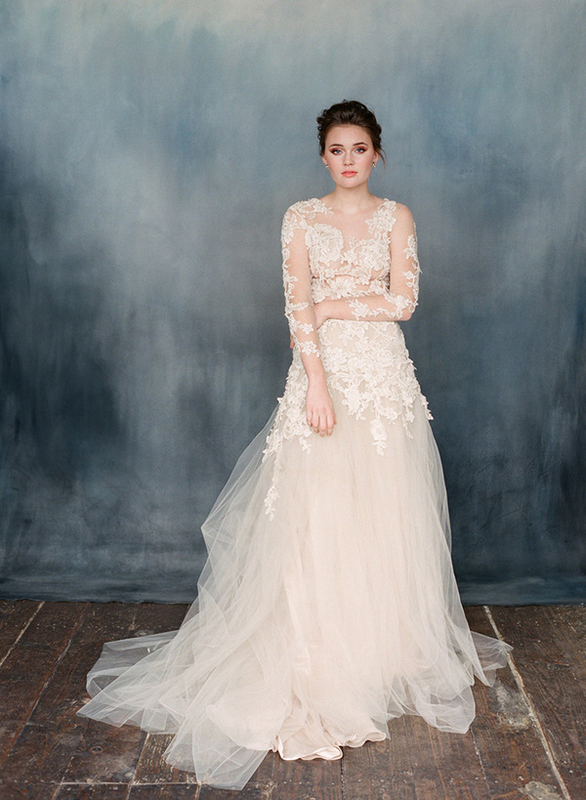 Once you have seen Emily Riggs wedding dresses there is no turning back… Romantic wedding gowns from Emily Riggs bridal with delicate hand beaded lace and floral embroidery that will knock your socks off! 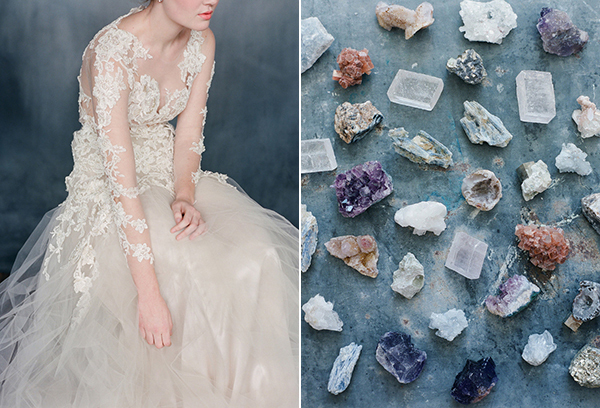 Her designs are as dreamy as they come…. 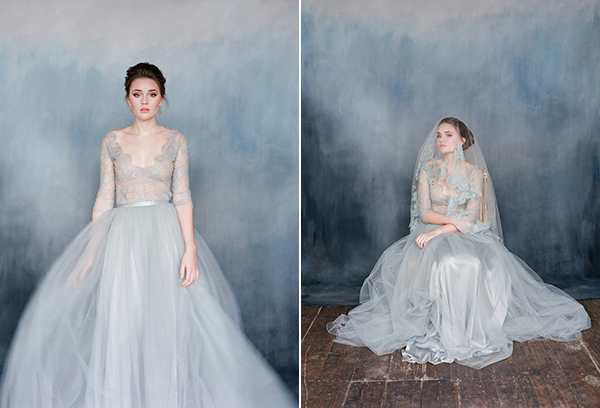 The light and airy Nightingale gown has a lovely gray silk and tulle skirt with subtle hints of blue. The gorgeous top is made from French floral lace and features a deep plunging neckline. Elegant & ethereal! The Arabesque gown overlay is truly one of a kind. Handcrafted with soft pale sheer Champagne tulle adored with beaded floral embroidery, pearls and seed beads and hints of gold. 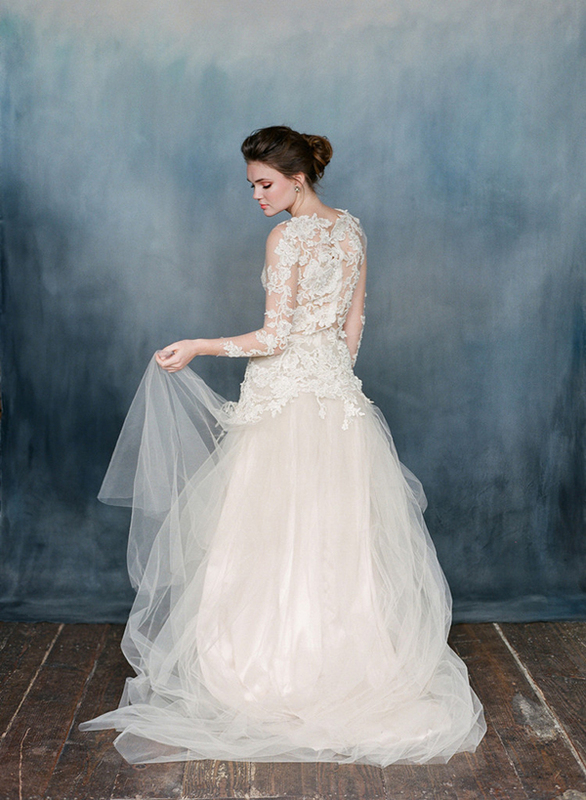 The gorgeous skirt has two layers of silk and two of champagne tulle. The Primevere gown in color Morganite is incredibly romantic. 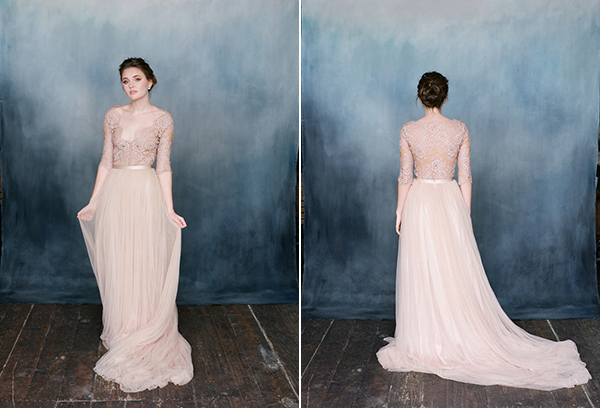 This unique design has two layers blush silk tulle and two layers of silk georgette and silk charmeuse. The floral lace top also has blush and bronze undertones. 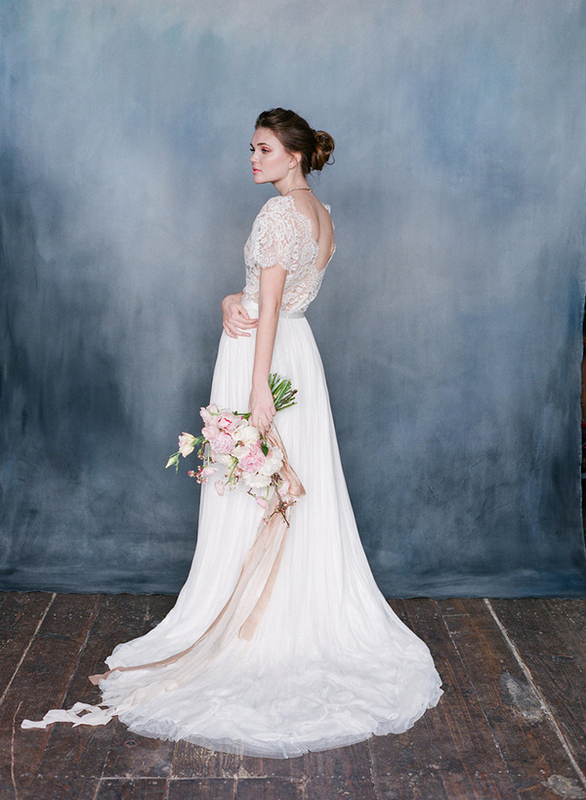 The Seraphina gown in Pearl features a beautiful top made with French imported lace and the skirt is made using silk georgette, silk charmeuse and layers of silk tulle. Luxurious and so romantic. 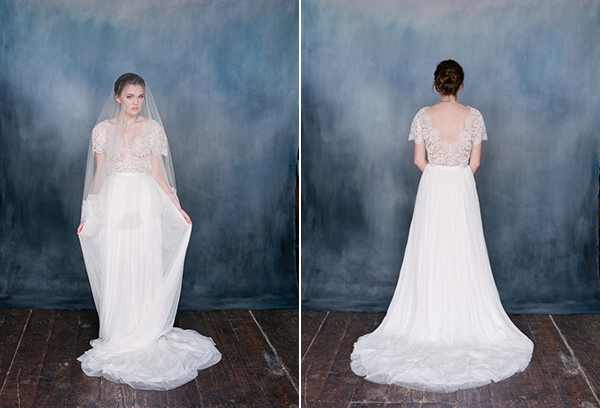 The Viola is undoubtedly a stunning gown. 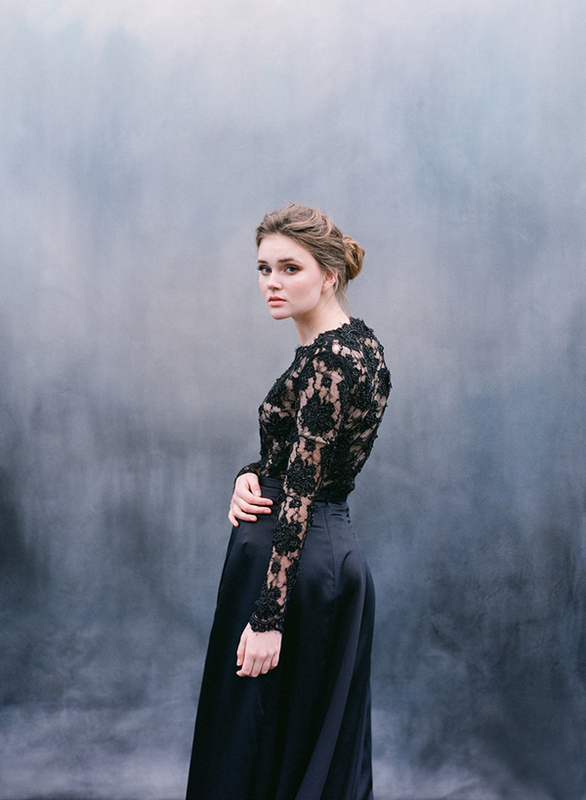 The french black beaded lace top is vintage and the silk charmeuse satin skirt is lined in black georgette with a satin waistband. And last but surely not least… the Delphnia gown in Chrysoprase.This dreamy design is made from seafoam silk tulle and Italian crepe silk satin. OMG. Super gorgeous. Love all of them!